Senator Magnus Abe has dismissed the news that he knelt down for the Minister of Transportation, Rt. Hon. Rotimi Amaechi, in order to actualise his ambition to rule Rivers State in 2019. The news was debunked via a press statement by Abe’s Media Office. 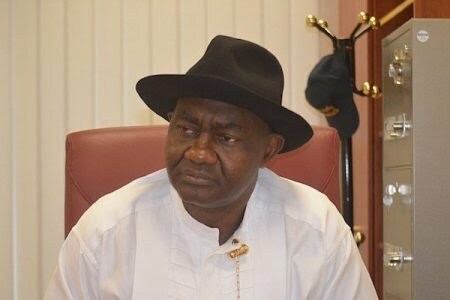 The statement said: “The attention of Senator Magnus Abe media office has been drawn to an unfounded report in the social media claiming that Distinguished Senator Magnus Abe knelt down to beg the Minister of Transportation and leader of the All Progressives Congress (APC) in Rivers State, Rt. Hon. Rotimi Amaechi to allow him a ticket to return to the Senate during a meeting of select party leaders in Abuja recently. “The said report by a self-styled media outfit known as ‘The Neighbourhood’ said in attendance at the meeting were Senator Abe himself, Rt. Hon. Amaechi, National Chairman of the APC, Adams Oshiomhole and select members of the party’s National Working Committee (NWC). “We hereby state that this trending story is another deliberate misinformation and mischief aimed at diverting public attention from the real issues and the reality on the ground. Let it be on record that Distinguished Senator Magnus Abe remains the governorship candidate of the APC in Rivers State following the mandate freely given to him by members of the All Progressives Congress (APC) during last Sunday’s gubernatorial primary election in the state. “There was no such meeting in the first place, and if such a meeting ever held, Abe was not privy to it and nobody can be in such a meeting in his stead. “The one thing presently occupying the mind of Distinguished Senator Abe is to actualize his ambition as Governor of Rivers State through a peaceful, acceptable and constitutional means come 2019 in order to deliver democratic dividend to Rivers people and transform the state into an enviable haven of industrialization and attract real investment. The statement also quoted Abe as having tweeted on his Twitter handle on Wednesday morning: “As a Christian, my knees are exclusively for the Almighty God. Those who fear God cannot kneel before man. Our struggle is based on our faith in God and His promise of freedom for the oppressed.